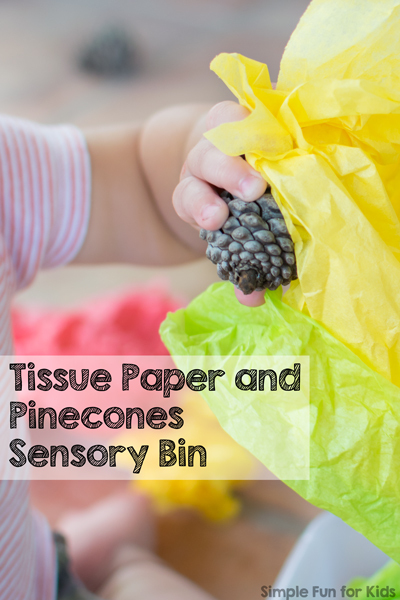 I wrote about this fun little boredom buster for toddlers over on Living Life and Learning: Tissue Paper and Pinecones Sensory Bin! I love it when I can keep my kids entertained with basic, everyday items – and this simple sensory activity did it beautifully! It only took a minute to set it up, and I really enjoyed watching N take his time exploring the items in his own special way that included interaction with me on his terms. Head on over to Living Life and Learning to read the full post! Are you looking for other simple sensory activities? Here are a few you might like!